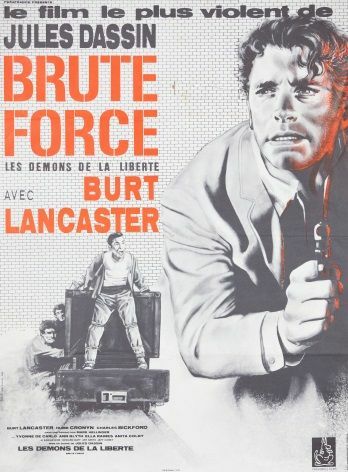 Vintage Movie poster from the film Brute Force which was produced in 1947. Released from solitary confinement, prisoner Joe Collins (Burt Lancaster) learns that his supportive wife, Ruth (Ann Blyth), is refusing surgery to treat her potentially deadly cancer, unless Joe can be by her side after the operation. But while Joe is plotting his escape with fellow prisoner Gallagher (Charles Bickford), a violent incident in the prison machine shop causes the entire prison to go into lockdown mode, overseen by the mean-spirited guard Captain Munsey (Hume Cronyn).